Another vertical sci-fi shoot ‘em up from the Hudson stable. 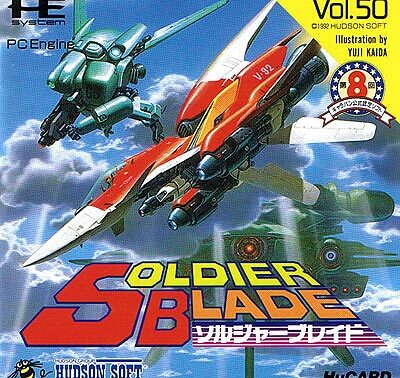 Soldier Blade sticks to the tried and tested formula of Hudson’s previous games in the 'series', while throwing in some extra graphical effects. This time, the power up system involves collecting coloured pods - you can have three pods in stock at any one time, and the colour of the 'active' pod determines your weapon style. You also have the choice of ejecting a pod at any time, which results in a weapon-specific super attack. One of the banner vertical shooters on the system, and widely believed to be the Apex of the Soldier series (and sadly much more expensive than the others nowadays. Graphically, this is as beautiful as any shooter on the system. Practically every sprite you see is exquisitely detailed, and the colour choices are perfection. The soundtrack will have a lot of fans too. I'd say the best of the series, and that's even if you include Star Parodier, the CD title. Is it the best HuCard based soundtrack? I'd certainly argue so. Playing Soldier Blade isn't just a game, it's an experience. Epic Bosses, huge screen filling weapons, and it's not ridiculously difficult or unfair. This game is arguably the epitome of 16 bit vertical shooters. I'd like to think this was also the time when home releases transitioned between straight arcade ports to a more balanced home-friendly format, and I'd like to think this series was at the vanguard of that evolution. From the beginning of the first level when you get dispatched by your carrier, then power past it into space, to the end of the first level, where the boss, on the edge of destruction warns "I'll be back" and flees, this game screams attention to detail.